I’ve written about judging competitions and also other aspects of competitions in the past but in the last year I’ve been involved in the judging and/or planning of two high profile competitions. I thought it would be interesting to take a broad look at how my thoughts on the subject have developed since my earlier writing. The first competition to address, and the most well known to us, is the Landscape Photographer of the Year, also known as Take a View. I’ve been critical of some of the choices made in the competition in the past but I hope always in a constructive way when looking at the bigger picture. Last year the competition asked me to take part in a brainstorming session about the following year and I was subsequently asked to help with the technical adjudication. Given the widely held view that you can do more from the inside by talking than from the outside by shouting I agreed to this. I did however attach a request. You see the problem I have with many competitions is that the first round, which in my opinion is the most important, tends to get the least attention. In the past this round of the landscape photographer of the year was done by two stock photography experts. However talented they may be they weren’t landscape photographers and I have a feeling they may have been more ‘urban oriented’ than the average photographer. My request was that the first round be judged predominantly by landscape photographers. Charlie Waite, the organiser of the competition, agreed to this and I volunteered myself and Charlie asked Pete Bridgwood and Trevor Parr (of the Parr Joyce Partnership). This struck me as a pretty broad minded group to filter down the original set of images. Once this round was over, Charlie Waite, Antony Spencer and Robin Bernard (Director of Bayeux Ltd) did another round of distillation and we can’t argue that there is good landscape photographer representation there! In my eyes the result was a well balanced book - although I would have liked to have seen an even balance on the final panel between recognised landscape photographers and other experts (That Colin Prior picked Nigel Morton’s primordial rendition of Epping Forest was a great win for the competition in my eyes). As much as I would have liked to have seen a final judging panel with the same level of landscape photographer representation as the first and second rounds, I can understand Charlie’s point of view that the general public are the target of the competition - after all it is they who consume photography and it could be an insular competition if it were only landscape photographers doing the judging. However there is the point of view that successful landscape photographers have already proved their credentials in creating work that the general public wants to see and, after all, competitions in other genres tend to have recognised experts dominating the judging panel (e.g. music and fine art competitions). In my opinion though, landscape photographers themselves should represent half of the panel with the final half split between on one side ‘critics and experts’ who work in the review and sale of landscape photography and on the other side a couple of the landscape loving ‘general public’. One of the conversations that always comes up with photography competitions is how much post processing to allow (if any). On the one side the ‘purists’ will say that you shouldn’t do any post processing and on the other side people say you should be able to do “anything you like - after all it’s art isn’t it”. On the other side, the “anything goes” crowd forget that we’re talking about landscape photography and hence there must be some connection with reality otherwise we could submit computer generated imagery of science fiction planets (and use the excuse that the texture mapping uses photographs of real world grass/bark/sky/etc). OK these are extreme readings but you get the idea. So how should we approach this thorny subject? Well it just so happens I was asked by the Natural History Museum to help with this very topic for the Wildlife Photographer of the Year. In the previous years competition I was helping with the judging and technical adjudication. As part of this there were lots of conversations about what adjustments were allowable. One of the tricky situations that cropped up was something called “floaters”. This is the name for the detritus and bubbles that become very obvious when shooting underwater imagery using strobe lighting. In the underwater community it’s generally accepted that cloning these out is part of the game. However the rules of the WPY (Wildlife Photographer of the Year) don't allow cloning at all. In the end some common sense was used where subtle cleaning was passed but heavy cleaning was not but this was obviously a problem. This year we had a long meeting discussing just what the rules of the competition should be going forward and, given that the next year was the 50th year of the competition, it was decided that a little experimenting with the rules was allowable. Having spent a long while thinking about this in the past I suggested that trying to place arbitrary restrictions on what is and isn’t allowable is a futile task and any restrictions should probably be chosen by the judges as part of adjudication - after all the judges represent the “Zeitgeist” (or they should). One of the founding tenets of the competition is about honesty and about not deceiving the audience. It was suggested that this approach could be applied to the problem and that we should let the photographers decide they want to submit as the final result doesn't deceive the public and the way the image has been created is described. This already applies in terms of how the picture was captured physically (i.e. whether bait was used, where the picture was taken, etc) so this honesty could extend to post processing. The judges could then decide based on submitted information whether they thought the techniques were acceptable. After much discussion it was decided that this wasn’t such a bad idea and so the rules will be “anything goes as long as the processing is documented and doesn’t intentionally deceive the viewer about the subject of the picture”. The key part of this rule is that it allows the judges to make their own decisions about what is acceptable and what isn’t acceptable - and after all this is what you want the judges to do! This allows creative work by the photographer if they think they can make a good case for it. Obviously some people will try to ‘cheat’ whatever you do (and will do so with cloning amazingly!) but by leaving things ‘open’ in this way we keep the judges looking at the picture critically rather than just accepting the images as they are. Obviously no set of criteria will make everyone happy but we have to accept that we’re living in an age where digital post processing is allowing people to create works of great beauty that may not have been possible in the past and we would be rash to close ourselves off to them without first seeing what they are. 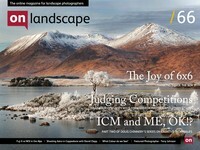 So what did I think of the final Landscape Photographer of the Year competition? Well overall it was a success I think. The book seems a lot stronger this year, especially the Your View section in my opinion, but I personally would have liked to have seen some more awareness of the context in which the images sit. David Breen’s wonderful image of Lochan Na h’Achlaise is one which you can’t argue is great and deserved to win the competition given the brief and the judging panel. However, you could ask yourself if other images may have been equally great and have shown an originality of subject matter and execution that lifted them even higher given the context of competition title “the landscape photographer of the year”. e.g. If we have a great picture of Durdle Door I would say it would have to reach that much higher than other pictures in order to win a competition category. This brief might not bring better pictures but it may promote originality. Is this the right goal for the competition? David said "I'm personally more proud of my second image in this years LPOTY - it's the underneath of a bridge, hardly a honeypot locale, but I created an image that works well - Rannoch Moor is easy to photo, I just got lucky that day as I drove past it to see it in hoar frost"
The alternative point of view says that icons are icons for a reason and they show some of the best that the UK has to offer and avoiding them on principle is perverse. Personally I think the competition is changed from last year and is heading in the right direction at a rate of knots and although I'd like to think I played a part in that you have to give credit where credit is due; Charlie has listened and made changes to improve the competition and I expect he will continue to do so.